There’s very little “natural” about the natural sweetener stevia when it ends up in your food in form of purified and decolorized steviosids. As a SuppVersity reader you’ll know that “natural” does not equate “healthy”. This, the proven anti-microbial effects stevia exerts in your gut and the fact that the currently available steviosid-based stevia products undergo more processing steps than than the dreaded aspartame warrant the question whether (a) stevia is safe and (b) as effective as other sweeteners when it comes to weight loss promotion. Since the optimal dosage of stevia to achieve meaningful effects is also not known, yet, scientists from the Alexandria University in Egypt investigated the safety ad efficacy of different amounts of stevia sweeteners (25, 250, 500 and 1000 mg/kg body weight per day) as a substitute for sucrose on weight gain or the weight loss and weight management of female rats on an ad-libitum diet. The first group was drank distilled water (Negative control), and positive control was given a dose of sucrose dissolved in drinking water at 500 mg/kg/day. This dose of sucrose used in this experiment was predicted to dose of stevia sweeteners equivalent concentration estimated by JECFA as control. To assess how much stevia the animals actually consumed, the scientists recorded the animals fluid intake daily. To ensure constant intakes in all groups, they adjusted the solution concentrations weekly based on the average weight of the animals and their current fluid consumption. At the end of the experimental period (12 weeks), body weights of animals were recorded and calculated of body weights gain (%) and feed efficiency ratio (FER) according to the method of Chapman et al. (1959). Figure 1: Body weight of rats treated with administration of sucrose (S) and stevia sweetener different dosages (25, 250, 500 and 1000 mg/kg) for 12 weeks compared with control (Elnaga. 2016). You probably expected that the replacement of sugar with stevia would lead to significant reductions in body weight gain, right? Well, if you scrutinize the data in Figure 1, you will notice that the effect went far beyond a reduction in weight gain. 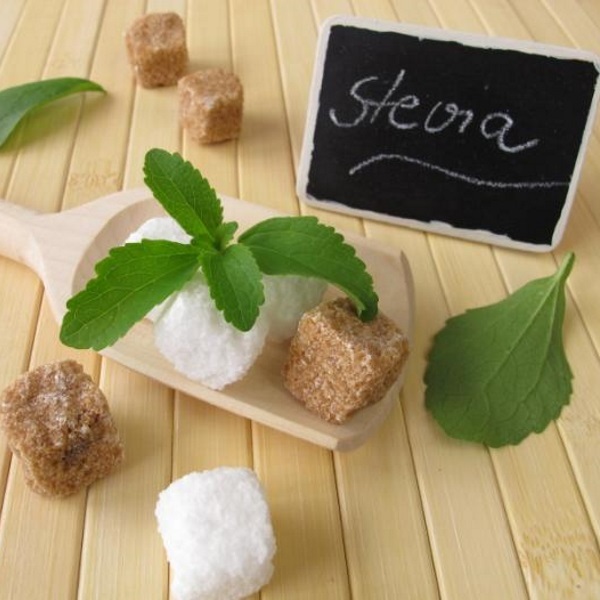 In fact, all stevia supplemented animals lost weight – dose-dependently 40.29%-48.29%. 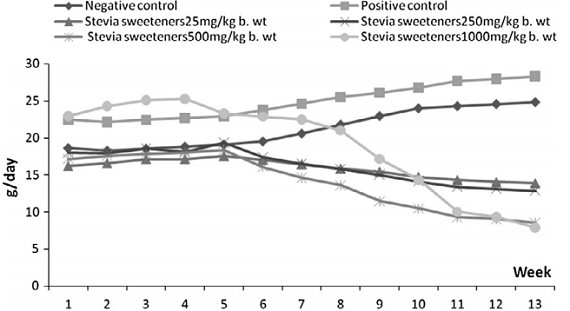 Figure 2: Organ weights relative to body weight of female rats treated with stevia sweetener at doses of 25, 250, 500 and 1000 mg/kg b. wt and sucrose compared with control (Elnaga. 2016). This certainly sounds like bad news, but the data in Figure 2 tells you that the weight of all important organs (liver, heart, brain, kidney, lung, pancreas and spleen) remained stable. Unfortunately, the scientists did not measure muscle and fatpad weight. Figure 3: Final body weight, feed intake and body weight gain % in rats treated with administration of stevia sweetener in different dosages (25, 250, 500 and 1000 mg/kg) after 12 weeks on ad-libitum diet (Elnaga. 2016). In view of the significantly reduced feed intake (>50%) and the even more reduced feed efficiency ratio (FER), of which the scientists say that it was the lowest at a dose 1000 mg/kg b.wt stevia ( -6.14) and increased with decreasing stevia intakes (-5.21, -3.22 FER and -2.91 FER), it would yet be unreasonable to assume that the weight difference was a results of fat loss, alone. What about human studies? And what’s the mechanism? Comparable human studies haven’t been done and the fact that a 2005 study by Chang et al. suggests that the body weight loss of rats receiving 5.0 mg/kg stevioside was due to the poor palatability of the food because of the high amount of stevioside. It is thus questionable if stevia would work the same magic in humans. Ok, in the study at hand, the sweetener was gavaged in the drinking water, but the food intake still decreased significantly. Significantly enough to trigger profound weight loss even in the absence of the reduced feed efficacy (see Figure 3); and even the reductions in blood lipids and glucose could eventually be a function of weight loss – even though, studies appear to suggest that stevia has insulinotropic, glucagonostatic, antihyperglycemic, and blood-pressure-lowering effects all of which would suggest that it could be more than a sugar replacement (Gregersen. 2004; Hony. 2006). … the VLDL levels were decreased 3.13%, 11.18%, 19.87% and 26.08% in rats given stevia sweetener at doses of 25, 250, 500 and 1000 mg/kg. The decreases in total, LDL and VLDL cholesterol stand in contrast to significant increase in HDL and corresponding decreases of the LDL/HDL ratio from 3.43 and 3.76 in the negative and positive control group to 2.90, 2.49, 2.30 and 2.18 in the 25mg/kg, 250mg/kg, 500mg/kg and 1000mg/kg groups, respectively. 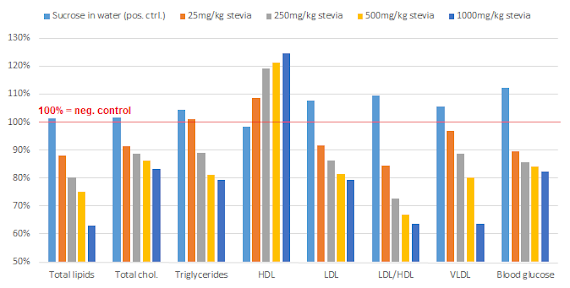 Figure 4: Blood lipids and glucose levels after 12 weeks on high sucrose water with different amounts of stevia replacing the sucrose in the water; data expressed relative to negative (=water) control (Elnaga. 2016). Ill effects on markers of liver health or general blood parameters were not observed and the significant decrease in blood glucose levels, I added to the relative changes in lipid levels in Figure 4, is certainly nothing to be concerned about. Bottom line: Just as the scientists put it, “the stevia sweetener treated groups showed significantly improvement and ameliorated reduction in bodyweight, BWG % and lesser intake of feed” (Elnaga. 2016). In conjunction with the “decreasing […] levels of blood glucose, total lipids, total cholesterol, triglycerides and low-density lipoprotein concentrations, and increasing […] high-density lipoprotein” (ibid.) concentrations the study at hand appears to suggest that stevia was a wonder-drug. Two things you must not forget, though, are that (a) the health benefits were most pronounced in comparison to the “positive control”, i.e. the sucrose guzzling rats that represent the average sugar-sweetened beverage junkie and that (b) the >40% of weight the rodents lost certainly didn’t come from body fat, exclusively. Chang, J. C., et al. “Increase of insulin sensitivity by stevioside in fructose-rich chow-fed rats.” Hormone and metabolic research= Hormon-und Stoffwechselforschung= Hormones et metabolisme 37.10 (2005): 610-616. Elnaga, NIE Abo, et al. “Effect of stevia sweetener consumption as non-caloric sweetening on body weight gain and biochemical’s parameters in overweight female rats.” Annals of Agricultural Sciences (2016). Gregersen, Søren, et al. “Antihyperglycemic effects of stevioside in type 2 diabetic subjects.” Metabolism 53.1 (2004): 73-76. Hong, Jing, et al. “Stevioside counteracts the α-cell hypersecretion caused by long-term palmitate exposure.” American Journal of Physiology-Endocrinology and Metabolism 290.3 (2006): E416-E422.